We tend to think of a character-based story as something quieter and more contemplative, like J.D. Salinger’s novels. Or, to keep with the movie comparisons, Jean-Luc Godard’s Breathless, which follows an enviable Jean-Luc Belmondo through a pretty average day in Paris, relegating the exciting details of his criminal life to the background and instead devoting time to his lounging around in bed with Jean Seberg. But the truth is that all of these stories live and die by the characters, regardless of how loud it is or how much plot it has. We know that Luke Skywalker and Jason Bourne have questions they need answered, dreams that need achieving, and doubts that need reassurance, all of which makes us care enough to follow them through their explosions. I vividly hated Fleming’s first Bond novel, Casino Royale, because it didn’t have all of the above (save the explosions, of course). Watching a vanilla, unknowable, interchangeable man who happened to be named James Bond move through an exciting plot was horrible to read. You’ll notice that the makers of the amazing recent film version didn’t just film a bigger story but a longer one – they wrote more, giving Bond some motives, desires, history, and, scariest of all, feelings. Plot-driven stories are simply character-driven stories in disguise. So the question isn’t, “Did the characters drive the story?” because every story has characters. The real question is, “Did I relate to what I read or saw on screen?” We enjoy stories when we participate in them, and when we relate to the characters we feel “sucked in.” We say that the narrative experience was good, usually forgetting side details like plot twists, weighty themes, pretty language, and everything else. I just finished mainlining the first season of Battlestar Galactica and these thoughts are heavy on my mind. I dipped my toe in carefully at first, not sure I wanted to commit to a new TV time-waste, and skeptical of any sci-fi show that appeals strongly to non-sci-fi people. Weary of on-the-nose “relevant” themes and “can you believe we’re telling a smart political story within a nerdy genre, can ya can ya?” I found exactly that and almost stopped watching half a dozen times before I realized I was hopelessly hooked. It wasn’t that I needed to find out what happened next (I could have gone to Wikipedia for that, and almost did), but that I felt deeply concerned for the people in the story and I really needed to know how they at least tried to answer their questions. I think all writers should study Battlestar Galactica for how it densely packs its unique and relatable characters into such a plot-dependent story. The show certainly has its share of wooden acting and forced scenes, usually because of shallow supporting characters who do their jobs and disappear quickly. And it’s true that other similar series, like Firefly and Doctor Who, have arguably “better” characters because they are warmer, funnier, and more enjoyable to watch. But what Battlestar lacks in these areas it more than makes up for in intrigue. The show’s value lies entirely in the innumerable novelistic questions, doubts, intricacies, and dilemmas of its main players, as well as their realistic human capacity for surprise, and the pleasure in watching them sort everything out. Even Joss Whedon, the king of warmth and humor (and creator of Firefly) has said that Battlestar Galactica made him want to go back to writing school. In the Season 1 finale (yes, I’m very, very late to this party), Katie Sackhoff’s Starbuck does what most of us would expect from that kind of heroic swashbuckler: save the human race. But, afterwards, she breaks down in a wail of frustrated tears upon seeing an enemy Cylon duplicate of someone she thought was a friend. Even worse, a fellow pilot stops her from killing the Cylon because, to both of their horror, the robotic Cylon is pregnant. The weight of this knowledge and what it might mean, the confusion, the despair at not being able to fully know what’s dependable anymore, all take their toll at once. 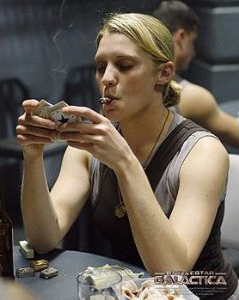 Sackhoff takes the cigar-chomping surface traits of Dirk Benedict’s foundation of the character in the original series and adds this wealth of emotional complexity, enmeshing us in Starbuck’s predicament; enmeshing us in Starbuck herself. What we just watched her do (saving the human race) was passably interesting in its basic fist-on-metal street fight kind of way, but so much less interesting than her reaction to it all a few seconds later. The moment is brief but it matters more to us than knowing what happened. We could find that out on Wikipedia, after all. Another, perhaps better, example happens later on in the same episode, when we get the shocker cliffhanger we’ve come to expect from serials ever since JR got shot on Dallas. What makes it interesting, different, disturbingly memorable, is the why. The character who caused the cliffhanger did so after grappling with ambiguity, fear, and insecurity for 15 episodes. Our shock is not because something particular happened, but because a particular character made a decision we weren’t expecting, because a character resolved a question in a way we wouldn’t. The season is full of people making unexpected decisions: Starbuck’s tearful confession to Adama, Adama’s refusal to forgive her, Apollo’s odd interpretation of his dad’s advice to trust his instincts, President Roslin’s unpredictable political maneuvers. It’s full of explosions, espionage, fistfights, and aerial combat, too, but it’s the decisions that make us tear up or cheer and, most importantly, come back next week. This entry was posted in Writing and tagged Battlestar Galactica, Casino Royale, Dirk Benedict, Ian Fleming, James Bond, Joss Whedon, Katie Sackhoff, sci-fi, Starbuck, writing. Bookmark the permalink.